Make holiday menus memorable with shareable small plates from Clear Springs Foods. Deliciously simple and elegant, this exquisite small plate appetizer will be a festive favorite for your patrons. 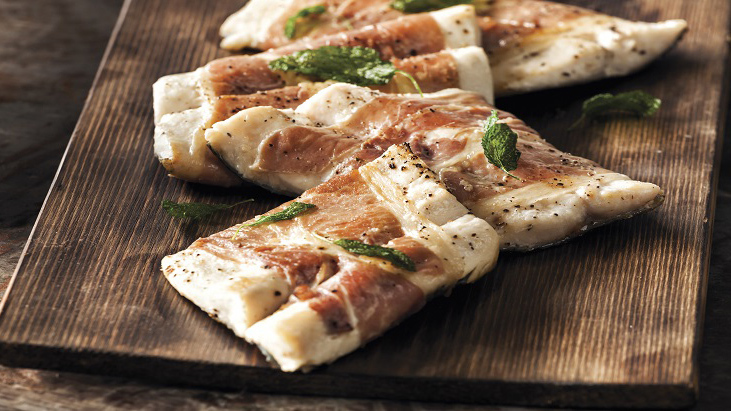 Wrap each fish fillet with 1 slice prosciutto. Heat a large, heavy, ovenproof skillet over medium-high heat until very hot. Add oil and coat the pan. Add fish to pan, top side down. Cook 2 to 3 minutes, or until prosciutto is lightly browned. Turn fish and cook 30 seconds more. Transfer skillet to oven; bake at 425 F for 5 minutes or until fish is fork tender. Meanwhile, melt butter in a small skillet over medium heat; cook until butter begins to brown, swirling occasionally. Add sage leaves to pan; remove pan from heat. Stir in sherry, salt and black pepper. Arrange fish on platter. Spoon sage and butter mixture over fish and serve.